The role of static guard has evolved from standing at a gate to the present day, where he or she is required to interact with our clients, staff and the general public. In order to ensure that our company is providing an up to the minute professional service, we at S-Security invest in our officers training and communication skills. The services are tailored according to the customer’s business and needs and they vary greatly. These requirements are vast and can range from access control to conflict management and worst case scenario situations. We have the expertise to deal with any situation as it may arise. During our forty years in business, we have experienced many unusual and sometimes difficult incidents, and throughout these situations, we have always had satisfactory outcomes for both our clients and ourselves. Our staff members are trained in vast areas of Information technology from Microsoft Word and Excel to close circuit TV and camera systems. 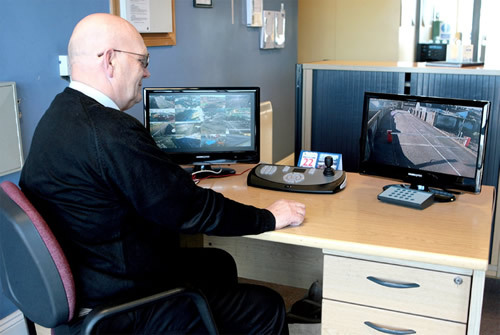 Our security staff in our control room are experts in securing your premises. To ensure the safe keeping of your house and belongings, A Static Guard presence is becoming more and more popular whilst attending a wedding or a funeral service. A static guard would be stationed at the home of the customer to prevent any type of theft whilst the family are away. Our highly trained officers will help reduce any problems or worries you may have, allowing you time to tend to family and other important matters as they arise.